Dan and I already think the world of Anne-Sophie. I had discovered her in Patricia Well’s book, The Food Lover’s Guide to Paris. There is a line in it, about the pea shoots tasting like she had just picked them off the vine and this struck me, in addition to that she is a no nonsense woman. 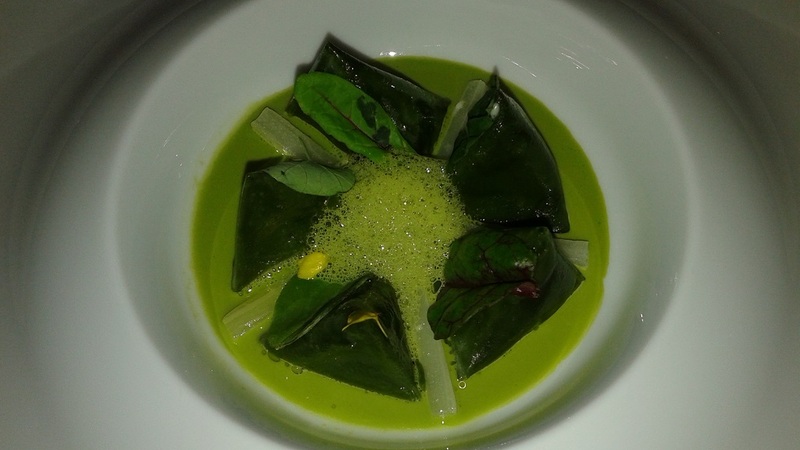 Plus we had the pleasure of dining at La Dame de Pic last year in Paris. The experience was stellar, so much so, we have both (mostly Dan though), kept our eyes out in the media for her name, just to see what she has to say and what others have to say about her. She’s very classy and elegant, but in such an understated way – it feels totally unpretentious and relaxing to be in her space. Her restaurant in Paris is all decorated white and her restaurant in Valance is brown tones, leaving the diners enveloped in a warm and earthy cocoon. The service was formal and extremely well-coordinated. We were seated in a table where we could see the wait staff emerge with the dishes and sometimes we could see them talking to each other, to get the details of service just right. 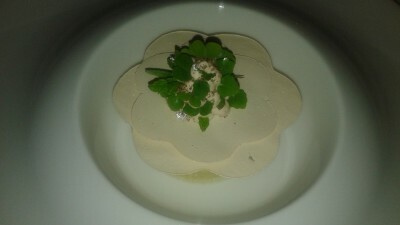 Our amuse bouche was placed before us – escargot with accents of tarragon and chervil. A rice cracker with black sesame seeds with a delicate dot of creamy fish and a curry flavored marshmallow accompanied it. Sounds gruesome but in fact, it was wonderful. Since the marshmallow was homemade, it was wholesome and not sweet and the curry stimulated the taste buds in unexpected ways. 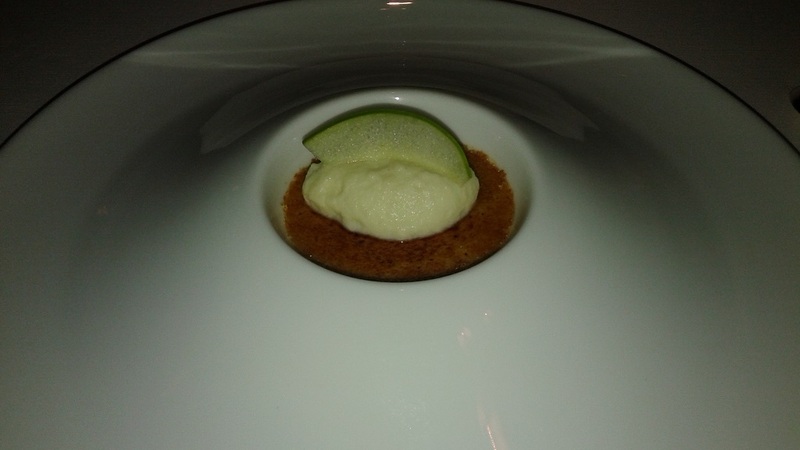 The next dish was foie gras crème brulée decorated gently with green apple cream and a slice of green apple. Can you say decadent? I mean, really. 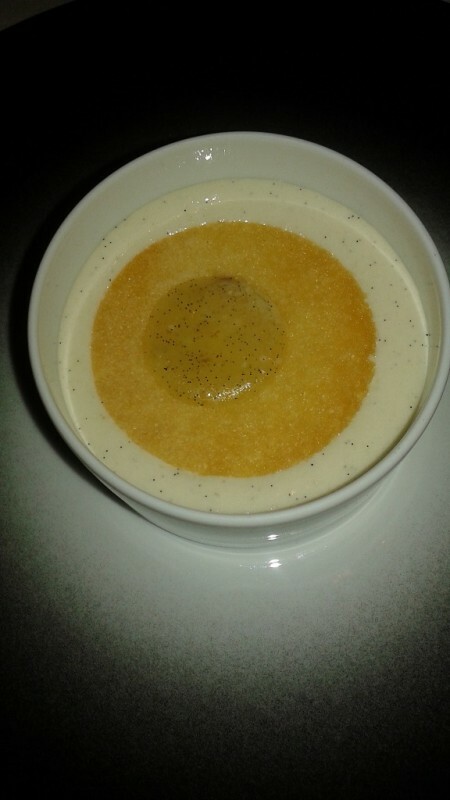 Goose liver mixed with egg yolks and heavy cream. My body was elated to receive such high quality and high density nourishment. We noticed the wait staff pass by and how they went about their work. They had a gift for evaluating where each table was in its dining experience. They took note of things like if we needed our water glasses filled and, at the same time, in the true French tradition, they never rushed us. We always seem to get through our meal slowly (even compared to other patrons), probably because we are taking pictures, making notes, and having spirited discussions about the food, our fellow diners, and the day’s events. 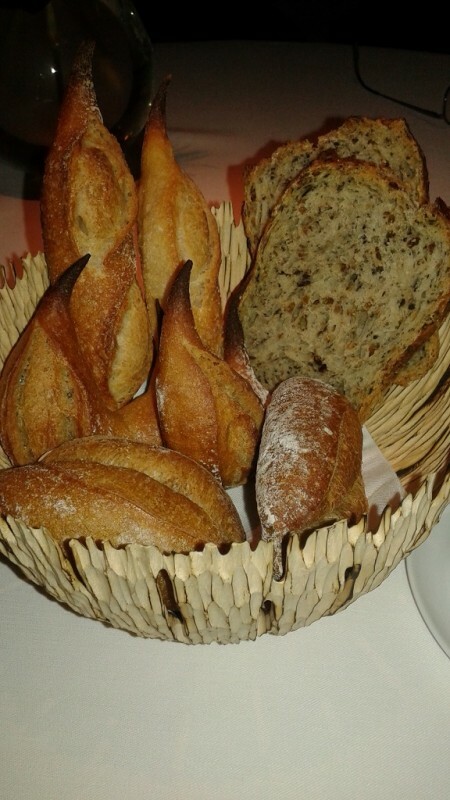 After the foie gras crème brulée they brought the bread. Many of the fancy restaurants still have pretty plain bread (cold baguette) but it was no surprise that Anne-Sophie is a cut above the rest in this regard too. We were told that the varieties of bread were baguette, green tea (from Japan), coffee (from Ethiopia), and beer (from a local brewery). Even without eating them, just looking at their artistic presentation, we received nourishment. The next dish arrived with perfect timing. 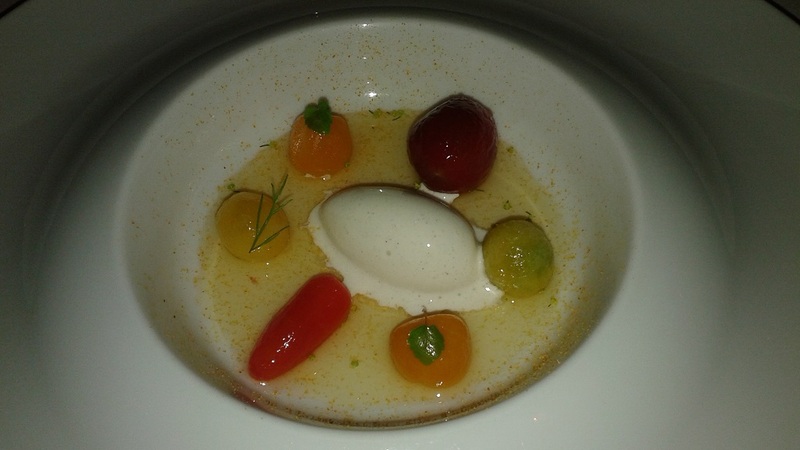 Six different colored tomatoes, with bits of smoked vanilla, a teardrop spoonful of mozzarella ice cream (not sweet), and the whole dish was lightly drizzled with an elderflower cassia (cinnamon) syrup. What they say is true, the tomatoes are more incredible in Provence (even though we weren’t quite there yet). We were in heaven. The dishes we ate off of, in and of themselves were interesting. The plates were large, and sloped upwards toward the center. The center itself has a depression, perhaps four inches wide and two inches deep. One could liken it to a small bowl, in the middle of the large plate. 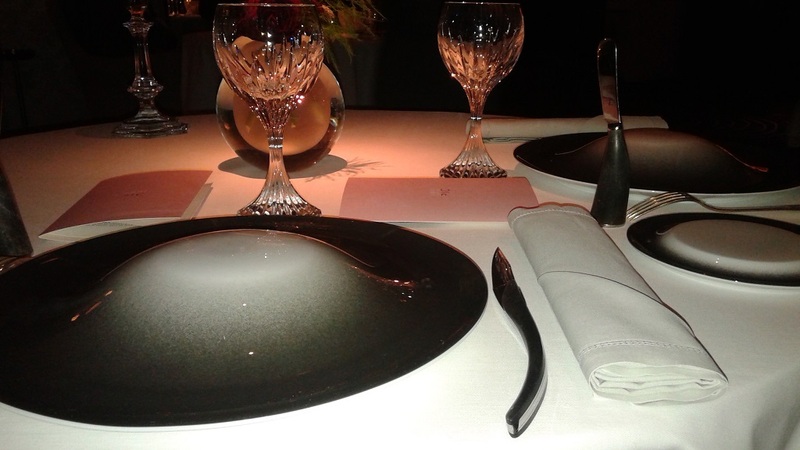 Anyway, it was in these little bowls that the dainty portions were actually served. The large plate was just for show. Many of the dishes came to the table with a Moroccan style lid on it. Two waiters brought our food and set each dish down in front of us simultaneously. Then in perfect harmony, they lifted the lids, so the food was revealed to us in unison. They really have every detail thought out and the choreography to match. Both Dan and I agreed that the show was stupendous. The next incredible dish was served. Cèpe with creamed chestnuts, swimming shallowly in a broth of fig leaves and cacao nibs. The cacao gave a rich nutty flavor and the fig leaves were unlike anything I have tasted before. Anne-Sophie incorporated the local ingredients in extremely creative ways. variation – six pieces of green tea pasta, filled with soft goat cheese and lightly smoked celeriac. The tiny pockets of pasta were nestled into some tender and perfectly cooked chard leaves. 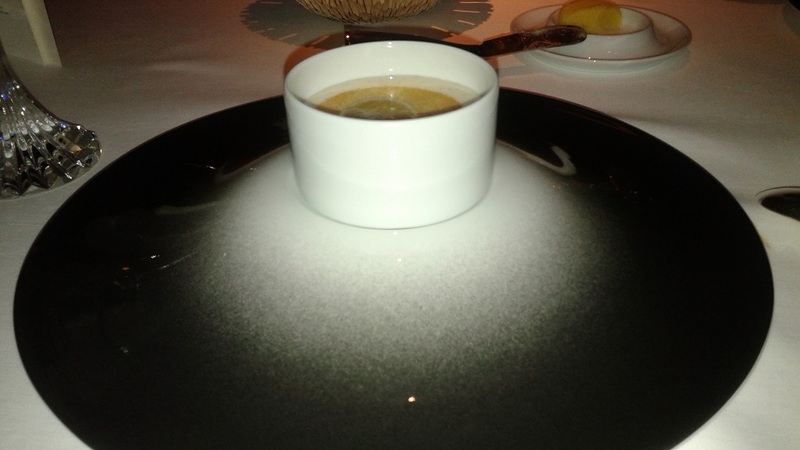 And we watched the waiter skillfully pour a bergamot and ginger sauce on top. We of course continued to affirm what a food goddess Anne-Sophie is. Interesting to note, but she did not go to school like most chefs do to learn her art. She was trained by her father and her grandfather. In fact, in the lobby, are large pictures of the three of them. Although it has evolved through the years, Maison de Pic began under her grandfather’s reign. And so, it has continued to be passed on through the generations. At some point, we saw a waitress drop some glasses and they broke. The reaction time was a fraction of a second, before another team member was there, to help clean up the mess. We were impressed (even with their mistakes!). Our main dishes were the next to arrive. 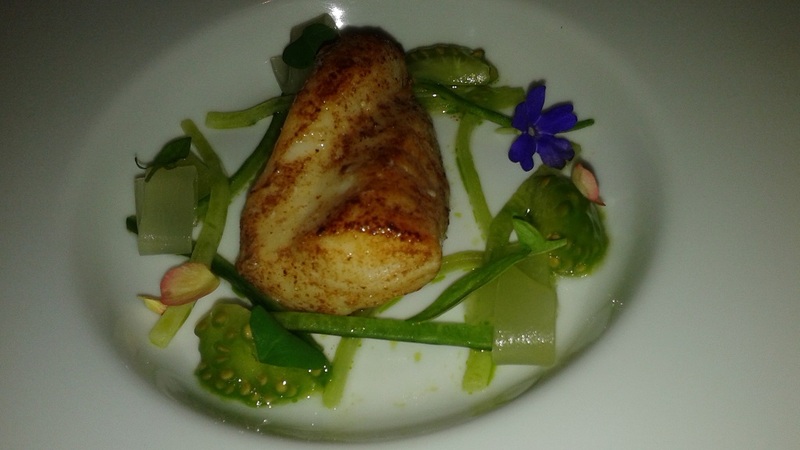 I had baked fish with lemon cucumber and green zebra tomato (one of the most attractive heirloom varieties), bathed in a vervain green tomato broth. Excellent. 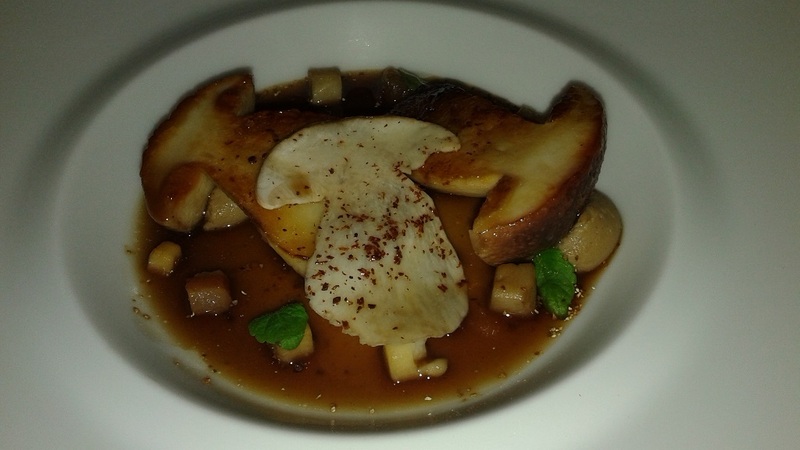 Dan had veal sweetbread that had first been marinated in sake and finished with a gruyere crust. Celeriac mash with tarragon and tender eggplant accompanied the protein. Also excellent. 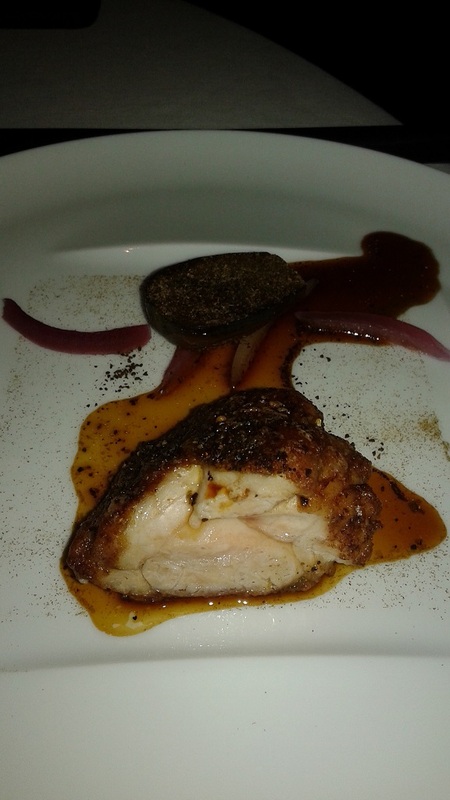 In fact, the whole meal and experience was excellent and that is a serious understatement. The only component of our evening that was not most excellent was that I was still beating myself up for the taxi debacle and listening to the two tables of Americans nearby chattering at obnoxious volumes. This is a theme everywhere we go and I just have not mentioned it before in this blog. But perhaps it was the fact that we now know WAY too much about this Bostonian couple’s bathroom remodel and how they blew their budget in the sticky process. Really. It is beyond both of us why Americans talk at decibels loud enough to wake the dead and even more confusing, about such personal matters (financial in this case), as if the rest of us care, let alone are not disturbed by it. OK – back to the fabulous meal. Now what came next, I really appreciated. 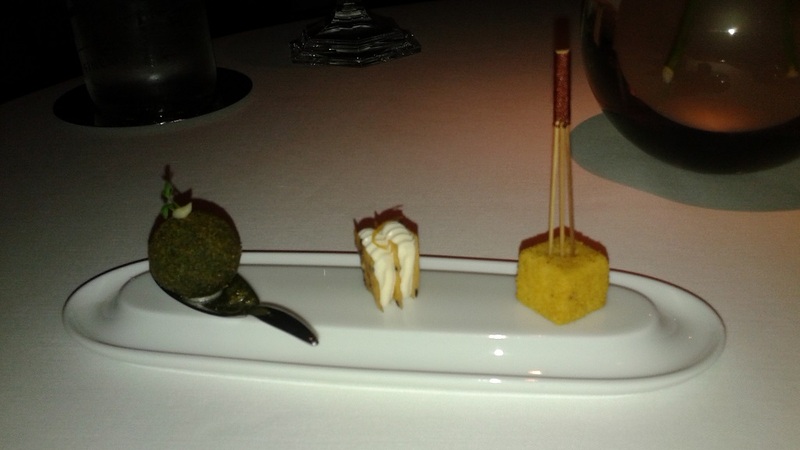 The cheese course is usually so heavy and served after one has had a full meal that we never can actually enjoy it. Anne-Sophie surprised us with a foamed brie, something like the essence of brie without the heaviness of it, infused with vanilla. Herbs are for sure Anne-Sophie’s trademark. She takes the same basic ingredients the rest of the chefs take (brie, fish, bread) and elevates the flavors by infusing unusual herbs or at least applying common herbs in an unusual way. It makes our taste buds dance in delight and for sure, it is what sets her apart from her compatriots. 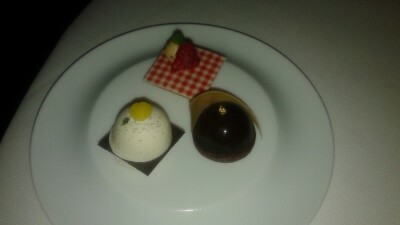 The final course, dessert, eventually arrived. 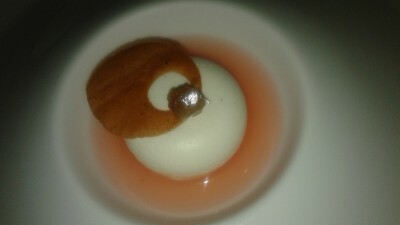 It was a roasted chestnut in a coconut cream enclosure accented with a grapefruit confit and just the right amount of grapefruit syrup. We sat there digesting our food and enjoying some tea and of course, praising the meal. 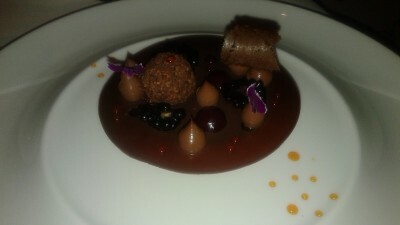 Now, based on last night’s meal at Bocuse’s, we have devised our own method for evaluating Michelin starred restaurants. One-five points are allotted for ambiance, service, food presentation and food taste. We sat there and wrote out our first version of what will be an excel spreadsheet. So far, two out of seven meals have scored a 20. It was no surprise that Anne-Sophie and Alain are neck in neck. We fully expect a three way tie, after we eat at Joël’s. This led to a discussion of tiebreakers and we decided it’s fair to have some “intangible” factor to break the tie. Dan without question puts Anne-Sophie first. It’s her deeply understated elegance and humble approach that wins Dan over. I noticed this as well and love it and see the value in it. I also agreed that Alain’s over the top spectacle was indeed, well how shall I put it, over the top. It wasn’t garish or gaudy, but it was SO beaucoup everything, that it was like watching a stupendous show, as opposed to blending into the elegance. Yet, his show was so astounding and well-orchestrated and the food was over the top (albeit in a different way than Anne-Sophie), that I am not willing to break the tie yet. We agreed to come back to this later on in the trip. 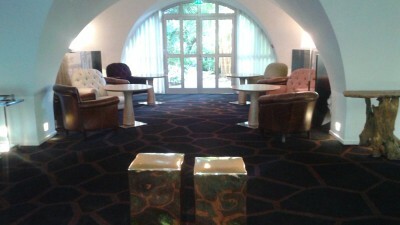 The waiter was kind enough to give us a tour of the downstairs of the hotel. He offered to take our desserts that we didn’t eat to the salon if we wanted to enjoy them there. We politely declined. He took us in the garden and showed us the salon. The décor was very unique. It was a mélange of different styles. Some chairs looked cowboy like, others wooden and dark, others light, others 70’s retro. This all being said, these unlikely partners’ paired rather well, much like the ingredients in the dishes. We went for a walk down Victor Hugo Blvd. It was no Champs-Elysees, it was actually a rather tired and somewhat run down street. The only thing establishment of any worthwhile noting was La Maison de Pic and her school, Scook, and her boutique grocery across the street from Scook. What she does, is done so well, that surely it is a destination in and of itself, and so it matters not what else is or isn’t on the street. It was close to 2am by the time we got back to the room. We noticed that they had come to clean our room, since we left it at 9pm for dinner. 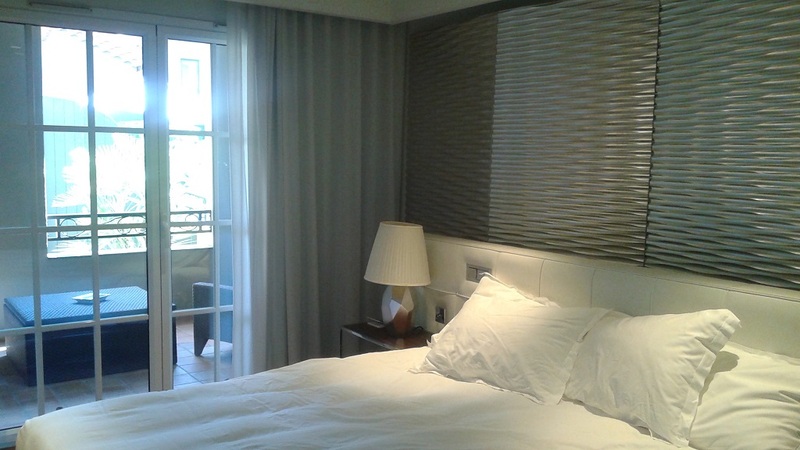 Fresh towels were in the bathroom, the nightlight was on (which was an inlay in the headboard) ,and a mat was placed carefully on the side of the bed, for us to rest our feet on when we would get in or out of bed. It was elegance and pampering, in its finest form.